Sacramento Farmers & Chefs is a much simpler concept. SF&C is an art project and 60 Faces is an art show. 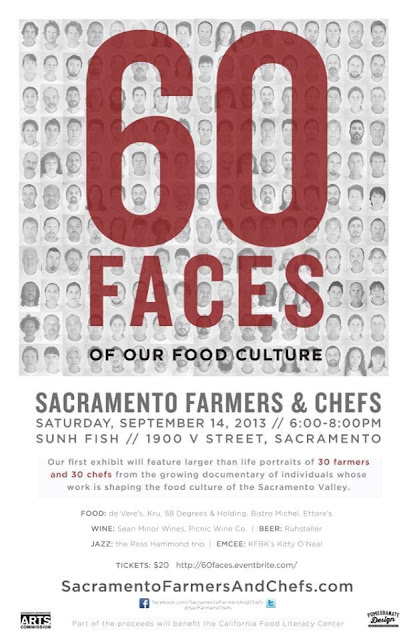 A show with the faces of 30 chefs and 30 farmers on giant glossy prints and many, many other local celebrities that will be featured in a slideshow. I guess a little back story is needed here, yes? The artist is Janine Mapurunga. She's a little woman from Brazil. She likes to take pictures. I have also come to know she likes to know all the why's and how's and what makes people do what they do. She's also a bit of a control freak and likes to make sure she is a part of every bit of minutiae involving every step of the process. And she is most likely going to choke when she reads that last sentence. None of this is bad (except maybe the choke part) Any individual that loves their craft is going to be more possessive than a momma bear. That's just how it is. And that is a-o-kay. Janine started this project with a few faces and her camera. This turned into so many faces, and then interviews, and then an idea to share what she was learning. Thus SF&C began to form and on September 14th will completely come to fruition. By the way, here is a little photo of her I took one day while at her home. And right after she had harvested a bagful of tomatoes for me to take. She is lovely and her heart is huge. She is a person who loves food, loves seeing the process of growing food and like myself, loves to see her friends enjoy food. She wants to share with the world what she loves about Sacramento and how huge the food culture is here in our city. Thus she has dedicated a year of her life to documenting the process and photographing all these individuals who are involved. Janine wanted a way to get close to each person. To share not only what they do - but to show what makes them tick - and to understand why. I also think she wanted to make the viewer question and wonder. Raising the curiosity level will heighten awareness will it not? And wont this in turn cause a greater appreciation for our surroundings? Or in this case - for the persons responsible for the food we love in Sacramento? Janine found a way to show the smallest tomato plant in someones' backyard - up to the biggest restaurants in the Capital City. And it is this project - Sacramento Farmers and Chefs. My part in this project is large or small depending how you want to view it. 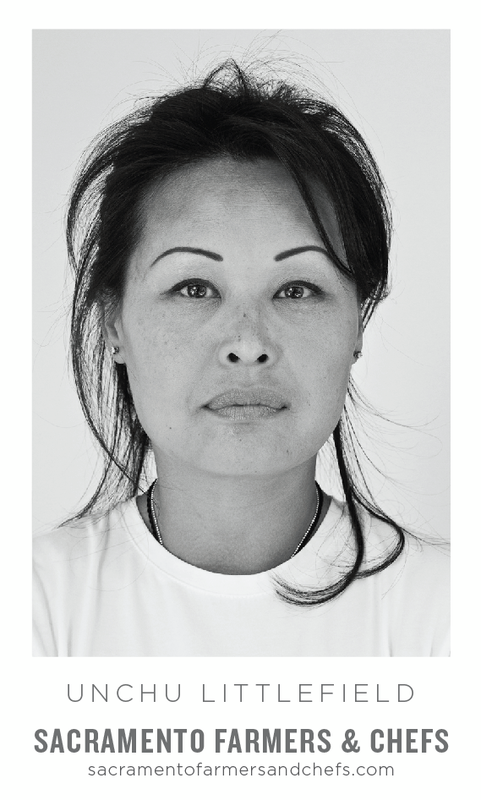 This past June she asked me to be one of her 30 chef faces and wanted an interview. I agreed. We met. She took some photos. We chatted. And I left. Yup - that's me. Thank you Janine for photo-shopping all the wrinkles and dark circles out of this image! In fact - while I'm promoting - let's add a link to purchase tickets! What started out as a whisper of a thought has grown into this beast of a concept. There are now over a hundred images. Hours and hours of interviews have been recorded and are being transcribed. Flyers and posters can be found everywhere in the city. All of this to promote the 60 Faces exhibit happening September 14th. There will be live jazz, delicious edibles provided by several local chefs, wine and beer from a few local spots. What else can I tell you? This will be big. Bring the kids and enjoy the evening. Whether chef or farmer or culinary teacher - their photo will be found in this archive. And Janine is not done. There will be many more added to this growing list of Farmers and Chefs and many more events to come. Will we see your photo next?